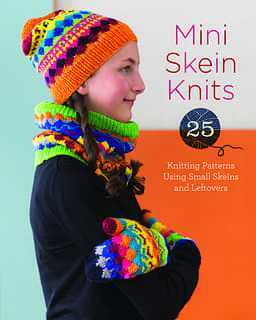 I have to say, I was pretty excited when Connie, the talented photographer of my Rhinebeck sweater and also an editor at Lark Crafts, emailed me about reviewing their latest book, Mini Skein Knits: 25 Knitting Patterns Using Small Skeins and Leftovers ($14.95 U.S./$16.95 Canada). When I blogged about knitting at the newspaper I used to work for, I was approached a few times about reviewing books, but they were usually for designs I wasn’t really interested in — yes, I can see the appeal of super-chunky baby knits, but not of knitting “sleep sacks” that are mainly meant for newborn photo shoots and not much else. On the contrary, this is a book I can definitely see myself knitting from — and I already have a few patterns in my favorites. The idea is that collecting mini skeins is so addictive, whether you buy them yourself or participate in mini-skein swaps, or both, but it can be tricky to figure out what to make with them. This book has a great variety of patterns, from simple coasters and coffee cozies, all the up way to beautiful sweaters, including two (A Mermaid Darkly, pictured below, and the Rainbow Cardi) designed by Sweater Expert, and the creator of my Rhinebeck sweater pattern, Yelena Dasher. There’s also tons in between — scarves, socks, shawls, cowls. My favorite — and the one I favorited first — is Jess Kallberg’s Head in the Clouds Hat, pictured at the top of the post. I love the subtle scallops, and I think it will be the perfect pattern for the mini-skein set from Pigeonroof Studios that I purchased ages ago — like, before Indie Untangled even launched (I was going to make a pair of gradient mitts, but I generally haven’t been gravitating toward projects much smaller than hats). 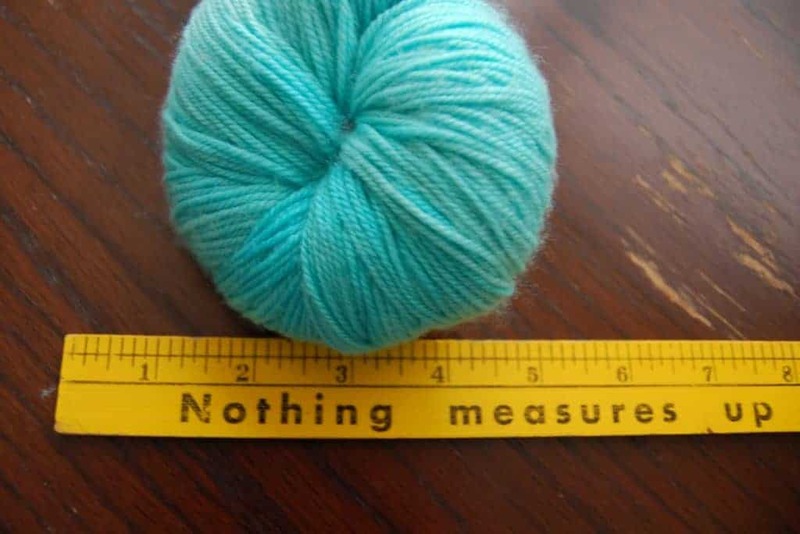 The yardage information is fairly detailed, so useful if you want to swap out mini skeins and use up leftovers. Aside from the lovely patterns, the two things I like most about this book are the beautifully styled photographs, which still show off the important parts of each design, and the prevalence of indie dyers, including IU’s Astral Bath, Kim Dyes Yarn and Western Sky Knits (not to mention, Madelinetosh, Orange Flower, Julie Asselin, Dragonfly Fibers and The Copper Corgi…). If you frequent this site, I’m pretty sure you will love this book. Connie and Lark Crafts have generously offered up a free copy of the book to a lucky Indie Untangled reader. To enter, comment on this post by the end of the day Sunday, Nov. 15, with the pattern (or patterns — I know it’s hard to pick just one!) you’d most like to knit. You can see them all here on Ravelry. The winner will be chosen via random number generator. This giveaway is now closed. Congrats to the winner, Lynn! This entry was posted in Book review, Giveaway and tagged books, cowls, giveaway, gradient, hats, indies, patterns, shawls, sweaters. So hard to choose! I’d get the most used out of the French Ticking Mitts, I think. Well, I have several gradient mini sets that would be beautiful for many of the patterns in this book, but I really like the Crazy Color Trio. Such brightness and cheer for the middle of winter! The Touch of Color Legwarmers are just perfect for keeping me warm this coming Winter (it’s supposed to be as nasty as the last one here in the Northeast)! The cowl is pretty cool as well, and would certainly keep a smile on my face whenever I wear it. I think the Rainy Day Shawl [http://www.ravelry.com/patterns/library/rainy-day-shawl-2] is the one for me – simply stunning. Thank you for letting us know about the book and thank you for the giveaway. Lots of fun patterns, but for some reason I’m really drawn to the Chevron Boot Toppers (not that I have any tall boots). I wonder how they’d look with a pair of Docs? What a beautifil book! All the pattern looks so nice, but i’d love to knit A Mermaid Darkly or Head in the clouds Hat with colorful scraps and minis! It is impossible to pick just one. My favs are A Mermaid Darkly sweater, Head in the Clouds hat, and Infinite Rainbow cowl. Everything is stunning! Loads of loveliness, but I love the look and name of the Rainy Day Shawl. Stunning!! Oh, that’s easy…I’m primarily a sweater knitter, so it’s A Mermaid Darkly all the way! 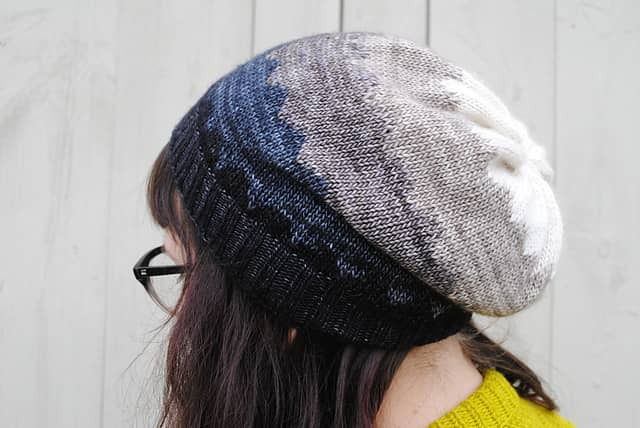 But, for gift knitting, Head in the Clouds hat is awesome. There are a lot of beautiful patterns in the book. I’d start with the Touch of Color Legwarmers. I love the Fair Isle style hat/mittens/cowl. This book would be great for stash busting, too!! I need to knit A Mermaid Darkly. I have a gradient set that would be perfect for it. I would have to choose A Mermaid Darkly. Beautiful sweater! I would love a copy of the book. My fave pattern: Mermaid Darkly. Right up my alley. I always have water colored skeins put together and raring to go! Thank you. I love the head in the clouds hat! So many wonderful patterns. I would have to go with the Infinite Rainbow Cowl. Ooooh, I love that hat, too! I also really like the line intersection scarf. Rainbow Cardigan all the way! Just for starts, naturally, because wow, what a lot of cool mini skein patterns! OMG I love this collection! I want to make a rainbow cardigan and an infinite rainbow cowl for myself, and the crazy color trio looks perfect for making christmas gifts! I love all the patterns though. Oh so many pretty patterns to choose from! It was a tough choice, but I really love the “A Mermaid Darkly”. That would be first, followed by the Lombard Street Scarf. Love the bright colors – just so happy! I love A Mermaid Darkly. I love this book. I need it in my library. I’ve got six years of Blue Moon Sock club minis. The sweaters are wonderful. So are the scarves. Thanks for the chance.